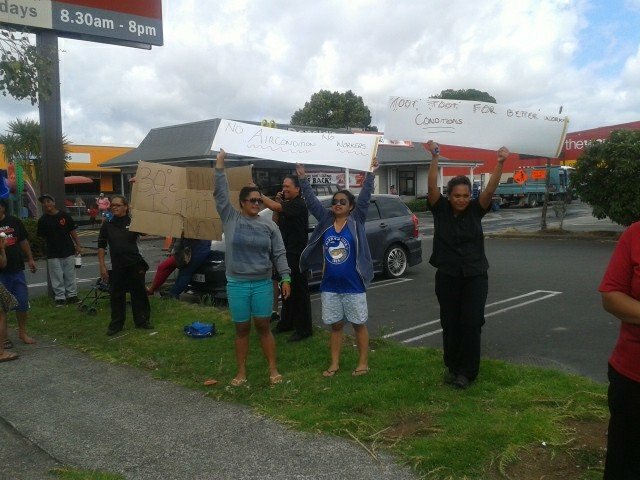 Kaikohe McDonald’s crew strike over health and safety. Workers at McDonald’s Kaikohe walked off the job today to escape the heat caused by a broken air conditioning system. Not only did management ignore repeated requests for the system to be fixed, but the Restaurant Manager would turn off the extraction fans sending the temperature through the roof. The ventilation system has been broken for over a month in the heat of summer. According to the workers, who began taking thermometers to work with them, the temperature inside the store was regularly exceeding 30 degrees. After the workers walked off the job, they were met by family and friends and marched down the main street of Kaikohe to be joined by a supportive and vocal community. Arthur Harawira, the local Mana Party representative, joined the workers on Broadway, megaphone in hand. A couple of hours later, the workers received notice that the air conditioning system had been fixed. “We are all absolutely rapped and proud of what we did today” said one of the workers. The claims and opinions made in this statement are those of the release organisation and are not necessarily endorsed by, and are not necessarily those of, The Daily Blog. Also in no event shall The Daily Blog be responsible or liable, directly or indirectly, for any damage or loss caused or alleged to be caused by or in connection with the use of or reliance on the above release content. No one should be forced to work in such harsh environments. Good for them. They should’ve had that fixed right when it happened.